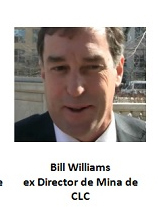 Photo that appears on Ecologists In Action website of GTac President Bill Williams, wanted in Spain for environmental damage to public property. In breaking news yesterday, a federation of over 300 environmental groups in Spain called Ecologists in Action (EIA) announced that Gogebic Taconite (GTac) President Bill Williams is facing criminal trial in Spain for multiple environmental violations committed while he was director of the Cobre Las Cruces (CLC) copper mine in Seville Province. Charges include the illegal pumping of arsenic-contaminated water into the local aquifer and other criminal damage to public property. Also being charged are François Fleury and Paz Cosmen, also employees of CLC. Williams previously denied any involvement with the environmental problems at Cobre Las Cruces, claiming that he left the mine before the damage was done. On July 19, 2011 Williams addressed a crowd at the Deep Water Grill (see video below), citing Cobre Las Cruces as an example of a successful application of the “dry stacking” technology GTac claims would eliminate toxic runoff from waste rock at its proposed Penokee Hills iron mine. The Spanish court case, however, makes it clear that operations at Cobre Las Cruces caused significant environmental damage and that this damage occurred on Williams’ watch. According to an article in No A La Mina, in 2008 EIA requested an outside hydrologist be brought in to monitor the water management system of the Cobre Las Cruces mine. At that time they also requested that judicial proceedings be opened against CLC for alleged crimes against the environment. The history of the Cobre Las Cruces damage has been documented by this group of independent scientific observers who caught Williams in the act. Back in 2003, the Hydrographic Confederation of the Guadalquivi* (CHG) gave the go-ahead for CLC to build the mine based on a new “novel” Drainage and Re-injection System (RDS) of groundwater that CLC claimed would keep the quality of water in the aquifer safe. However, EIA testified repeatedly of the impossibility of such a system to work. In 2006, construction of the mine began, and in 2007 EIA filed complaints with the CHG, charging that nearly all aspects of the new re-injection systems were failing. From 2007 to 2008, Williams repeatedly disregarded CHG’s requirements that CLC fix the faulty system. In May 2008, the illegal wells were closed and operations of the new system were suspended, although no formal complaint was made. But because of the persistence of the independent observers, the prosecutor finally filed a complaint with the court of Seville. Williams and other representatives from GTAC have repeatedly stated that they will use new technology to protect the water and air in the Penokee Hills, although they have yet to produce plans for such a system that could eliminate acid mine drainage or asbestos fibers from being air- and water-borne. Like Cobre Las Cruces, GTAC is making promises that independent scientists are refuting as impossible. Whether or not Williams will be extradited to Spain remains to be seen. One thing is certain, those who have been desperately fighting the flood of misinformation and misrepresentation on GTAC’s part in Wisconsin have much in common with EIA in Spain. It is the independent scientists—Dr. Joseph Skulan, Jason Huberty and Dr. Tom Fitz to name a few—that have been working to bring true scientific information to light. Once again, this is news no one talking about beside wcmcoop. Thank you for yet another revelation of what the hell is going on in Wisconsin…and apparently Spain. Here’s Bill Williams talking about his work in this mine in a 2009 article. Viva Las Cruces! Thank you for this information. This is the first I have heard about CLC. The same man that brought Wisconsin masked guards armed with assault rifles now brings you a possible environmental disaster in Wisconsin.